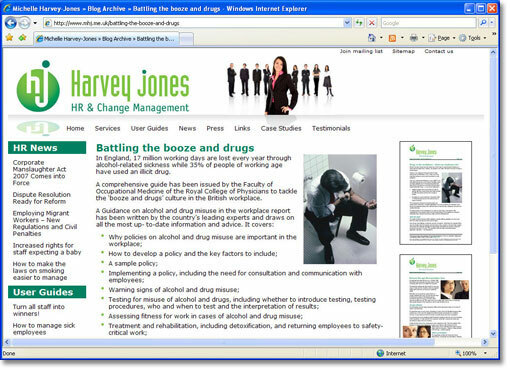 Below are some screen shots of the Harvey Jones HR and Change Management website. To see the full size screen grabs simply click on the image. To view the live website please click here. 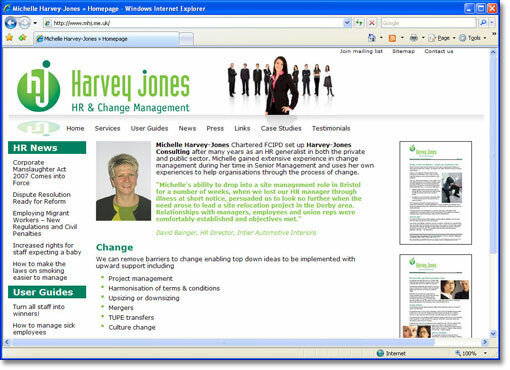 The aim of the Harvey Jones website is to provide a smart, modern, clean, professional and stylish shop front for an HR consultancy. This was achieved by keeping the layout simple and uncluttered, the theme was white to create space and keep the visual impression clean. The design also had to incorporate the existing branding which included the logo, the font and the two shades of green. The logo was reflected and emphasized in the opening flash banner, the dark green was carried throughout the site in the headers in the left hand column and the lighter green was used to pick out features such as highlighted text, image borders and bullets. One of the most important elements of creating a strong design for a website is a good header design that is integrated with the rest of the page. Attention was initially drawn to the header with an eye catching flash header that builds up the header out of its constituent elements, playing particularly on the strong logo design. The use of the reflection is a modern web design classic which gives dimension and the impression of clean, new, shiny surfaces and further emphasizes the logo. The use of images of business people can easily be a design cliché if misused but considering that this is for an HR consultancy, for which people are the core of the business it was felt appropriate and makes for a striking component to an effective image. Another important factor in web design is to draw the visitors' attention to the content of the site. This site has some strong dynamic content in the news, user guides and case studies. This interesting and dynamic content not only provides excellent link bait to draw people to the site via search engines, but also provides "sticky content" which attracts return visitors and furthermore gives the company reason to contact existing clients via RSS feeds and regular email newsletter broadcasts. This keeps the company at the forefront of clients' minds and provides a good reason for visitors to sign up to the mailing list. This integrated site provides Harvey Jones with an attractive "shop front" to promote themselves as a reliable and knowledgeable consultancy with their finger on the pulse of HR, attracting new business, retaining existing clients and establishing Harvey Jones as a market leader.